Let me begin by explaining what an earth oven is. An earth oven is a cooking technology that has been widely used in the Lower Pecos for thousands of years. To create an earth oven, a pit is dug into the ground and a fire is built. Large stones are placed amongst the flames; these stones retain the fire’s heat and become the oven’s heating element long after the fire has died out. Next, a layer of packing material is laid across the hot stones in order to insulate the food from direct heat and provide moisture. Prickly pear pads work great for this and can be found in abundance in the Lower Pecos. The food load, the trimmed hearts of the desert succulents sotol and lechuguilla, is placed on top of the packing material followed by another layer of packing material. The oven is then capped by a thick layer of earth to prevent precious steam heat from escaping. After cooking for at least 36 hours the food is ready to be unearthed and consumed. Processing sotol for an experimental earth oven. The baking process turns the complex carbohydrates within the plants into sugar. These plants also contain a chemical called saponin, which is inedible in its raw form but is rendered harmless by the cooking process. 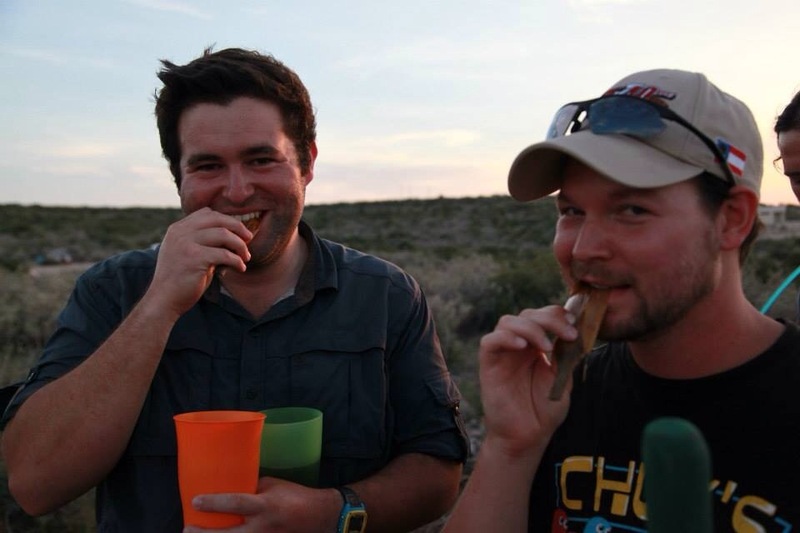 I can tell you from experience that baked sotol doesn’t always taste good, but it is a reliable food source in a harsh and highly variable environment. As part of the ENC project, one of the research topics we are interested in is calculating how much earth oven processing occurred at different sites, i.e. how many times each earth oven locale was used. Fire-cracked rock (FCR) is the most common remnant of an earth oven cooking facility found in an archaeological context. In the field we have been sizing, counting, and weighing the FCR that we find in each layer of our excavation units. What we find most often, and what makes up the majority of the enormous talus slopes in front of the shelters, are FCR that have been discarded after multiple heating events and are now too small to store heat efficiently. However, in order to find out how much earth oven processing has occurred we need to do more than just count and weigh the burned rock coming out of our units. We are planning to do this by trying our hand at some Experimental Archaeology. One of the challenges for archaeologists is understanding how the things you find in the ground are related to human activity—especially when it comes to burned rocks. So, we carry out different experimental archaeology projects to help us figure out what burned rocks in the ground might represent. Collectively, we have built many earth ovens to demonstrate the plant baking process from start to finish. However, beyond demonstrating how local edibles were processed by those who occupied the rockshelters we work in, we did not collect any real scientific data to help us answer questions related to earth oven processing. So, we are planning a series of long-term experiments by creating our own earth ovens. We hope to document the number of plant baking episodes necessary to significantly reduce the size of our heating elements (rocks) to the size of the FCR that we are finding in burned-rock middens (BRM) throughout the canyon. On Thursday the ENC crew searched the property surrounding the Shumla campus for a new site for our upcoming experimental earth oven. When seeking out the new oven location we tried to keep in mind the qualities that would have appealed the natives who were using this cooking technology for their survival. The vast majority of optimal locations we saw while traipsing through the always-thorny local shrubbery were already occupied by evidence of prehistoric plant baking – fire-cracked rocks. What makes a location optimal is its proximity to the trifecta: fuel, food, and dirt. Native peoples would have tried to find a location that was relatively close to all the fuel, food, and dirt they needed to construct and fill the oven so they wouldn’t have to expend extra energy hauling in supplies. Eventually we found a pristine location untainted by archaeological evidence. In anticipation of building our first earth ovens in the new locale, our first task is to collect phosphate samples at the recommendation of our geoarchaeologist colleague Ken Lawrence. Phosphorous (or P) analysis looks at the phosphate that accumulates in sediment by many aspects of human activity. What’s great about phosphorous is that it decays very slowly through geologic time, so it’s a reliable element for targeted study. Our goal in using this method is to analyze how quickly and at what levels phosphate will accumulate in sediment that has been manipulated by plant processing and baking. To accomplish this we will be taking initial baseline samples at the oven location, and then Ken will come back and collect more once we have started processing. This is important to archaeologists because it gives us another way to interpret the intensity of the plant processing that occurred at local sites. By understanding how much earth oven processing occurred, we will be able to compare how many times different sites were used, and gain a better understanding of how people moved across the LP landscape. We can’t believe how good it tastes! In a few weeks we will tap the trifecta and start building ovens and monitoring the cracking rocks. 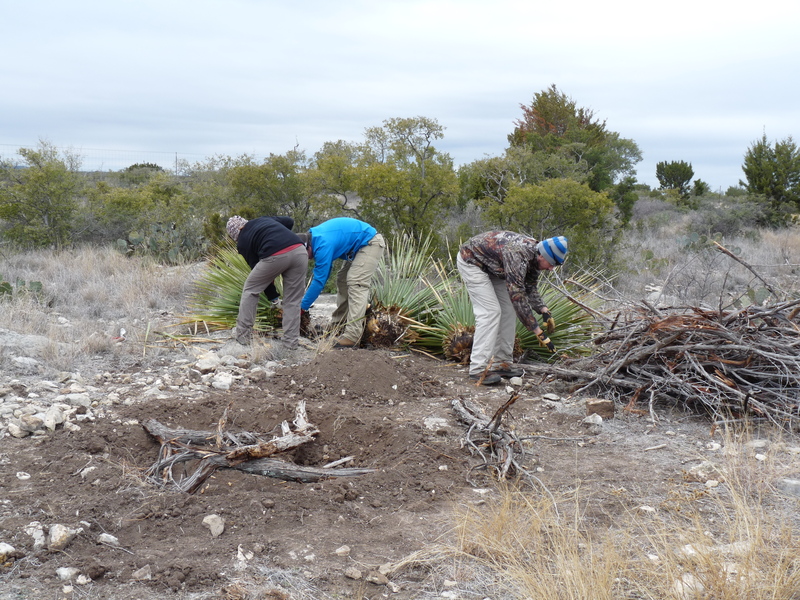 We will also be following a pattern that native peoples must have relied on – in the winter, lechuguilla and sotol are among the few potentially edible plants that can be harvested. This entry was posted in Earth Ovens, Fire Cracked Rock, Spring ENC 2014 Posts. Bookmark the permalink. Thanks for another great post! Keep ’em coming! Just curious as to where this experimental location might be. Mussel shell recovered from burned rock middens and talus in the Lower Pecos suggests that they might also have been steamed/cooked in earth ovens. True, but we might find dozens or at most hundreds of mussels at most LPC sites, but never the thousands that a even small shell midden would have. Ergo, clams must have been a modest dietary supplement. And we rarely find whole shell halves, suggesting they were broken up for raw material used to make shell beads and other things.